A few months ago, I went to dinner with a group of girls that I've known forever. Many of them are married, have kids, are pregnant, are trying or are considering trying soon. As we sat around the table, the convo switched to kids - as it often does when you're hovering around the age of 30. The discussion was not all squishy bums and baby powder. Things got real. They opened up about the sh*t nobody talks about when preparing for pregnancy. Yes, there was plenty of excitement. But fear, doubt and isolation dominated the conversation. It was overwhelming to hear - let alone experience. A few days later, I was still thinking about the whole thing. There is so much information about fertility and prenatal care, that it can be difficult to navigate it all. All the information seems to create additional and unnecessary stress among families trying to conceive. I brought it up to my friend Annie. Annie is the owner of Villager Yoga and my personal yoga partner in crime. As the owner of a family-focused studio, it turns out, she has been hearing similar stories from yoga students. There has been an increasing number of requests for yoga and meditation during pre-conception. We decided to join forces and create a program to help support and alleviate some of the stress and fears associated with this special process. Both Annie and I work with women and women's issues daily. We have a passion for this work. So we decided to take our knowledge even further and dive into studying preparing the body and the mind for pregnancy. I even had the opportunity to attend the Food as Medicine course conducted by the Center for Mind-Body Medicine. The 5-day course was hosted by The Kripalu Center for Yoga and Health and focused on Women's Health and Solutions. 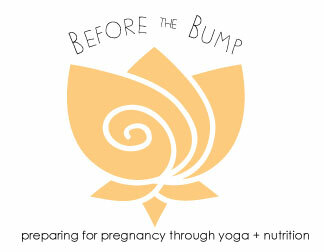 It was the perfect addition to round out what Annie and I have been planning: Before the Bump: Preparing for Pregnancy through Yoga and Nutrition. After years of teacher training and workshop collaborations, we are really excited to bring this workshop to the Birmingham community. Through our combined experience and training, we have created a program that will provide a supportive, nurturing environment where women can learn how to prepare, body and mind, for pregnancy. This 6 week program starts January 25 and is designed to cover common preconception questions, through the yogic lens. We will teach nutritional guidelines, stress reduction tools, and yoga sequences to balance the endocrine system and activate reproductive organs. This is a very personal process, but it deserves attention, knowledge and support. If you are currently trying or wanting to start trying in the next year, I hope you consider this course. Give yourself the gift of support, acceptance and nutrition. UPDATE: New series starting November 2015! Register Here -------> Before the Bump.